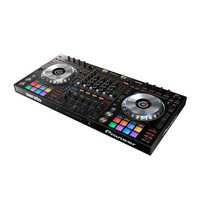 Providing an intuitive and dynamic performance with pro-grade jog wheels and layout including multi-coloured pads the DDJ-SZ is a professional club-oriented DJ controller specially designed for Serato DJ. This entry was posted in Pioneer and tagged PA-DJ-and-Lighting. Bookmark the permalink.